What makes a great NBA Finals: Seven games? Game-winning shots? Career-defining performances? Outlandish narratives? It all matters. Matt Zemek and I look back on some of the greatest NBA Finals in history. Jerry West waited 12 long years before finally winning a championship — on one of the greatest teams in NBA history, the 1972 Lakers — because of the impossible-to-replicate success of the Red Auerbach-Bill Russell Celtics. In 1969 West suffered his toughest defeat at the hands of his rival Celtics. West famously averaged 38 points for the series, and notched a triple-double (42 points, 13 rebounds, 12 assists) in Game 7, but the Lakers dropped the final game, 108-106. A shooting guard, a point guard — it doesn’t matter what position we consider West: The Logo was simply a legend. Watching him will his (barely) inferior team as close to victory as possible must have been exhilarating. I was hardly a thought in the way, way back of my parent’s minds in 1969. Of any NBA Finals that I missed, I wish I was alive for this one. The Lakers (5) and Celtics (3) combined for eight titles in the 1980s, but they played each other in the NBA Finals only three times. L.A. won in 1985 and the rubber match in ’87, while Boston won the lone seven-game series between the two teams in ’84. We are currently living through one of the most fun stretches of professional basketball ever. Competition has never been better, defenses have never been more advanced without sacrificing any scoring, and the perimeter shot — led by living legends like Stephen Curry and Kevin Durant — is changing the possibilities of offensive basketball. Basketball, like any sport, is guided by the players playing it. You can’t talk about the modern game without talking about the impact LeBron James has had on the direction of the league. He’s played in five consecutive NBA Finals, creating high efficiency shots all over the floor for himself and his teammates because of his unique combination of size, speed and smarts. He’s Magic Johnson with locomotive breath. No player since Michael Jordan has faced higher expectations, and considering how much LeBron has actually accomplished since donning the Sports Illustrated cover at 16, it’s amazing how everything has played out for him. He’s everything we imagined and more. Yet, it’s been a process. Yes, the 2013 NBA Finals — which I wrote about Saturday — was a shining beacon for the greatest small forward ever, but LeBron doesn’t win the 2012 and ’13 titles without first failing immensely in 2011 — by far the most bizarre and entertaining NBA Finals of the modern era. As Matt and I discussed during our ranking of the greatest NBA power forwards, Dirk Nowitzki’s entire career would be viewed differently if the Mavericks didn’t take down the Heat in 2011. How Dallas pulled it off still doesn’t make much sense: Nowitzki’s best teammate was an undersize combo guard averaging 17 points per game; Miami’s Big 3 was in its first season, and their ultra-confidence perhaps blinded them from seeing the task at hand. Coming off the heels of 2000s basketball — 80-point games and minimal floor spacing — the style that Dallas employed to slay Miami, as well as run through a loaded Western Conference, was damn near futuristic. 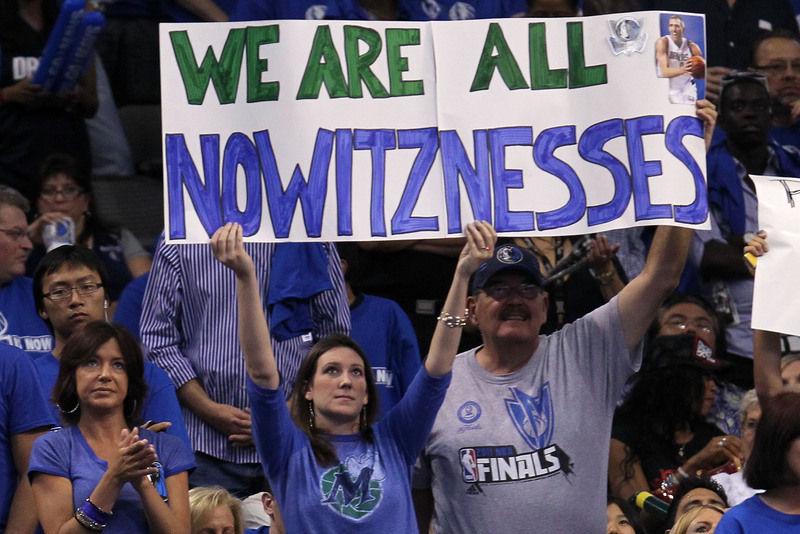 Nowitzki isn’t a better basketball player than LeBron, but for six games he made the bigger impact. LeBron never forgot that, and he has been a different basketball player because of it. What a Finals. Arriving at number five on this list was difficult. The 1984 Finals were riveting, but too often defined by inelegant moments and lopsided games. The 1958 series owns a central place in the conversation. The 1977 series also deserves consideration, because the Portland Trail Blazers were so artful in taking out the Philadelphia 76ers. However, that was a series in which one team largely controlled the action. For me, a truly great Finals should involve two teams trading punches, and while Philadelphia led that series, 2-0, the 1977 and 1978 Sixer teams are both viewed as underachievers. I’m not quite convinced that series should be number five, though it’s a close call. The Boston Celtics always had the Los Angeles Lakers’ number in the 1960s, and the 1969 series was as much defined by Los Angeles’s failures as it was by Boston’s successes. Why does that series fall below 1984, for reasons beyond “I didn’t watch the games?” The 1969 Celtics were old at a number of key positions. The 1984 series featured Boston and L.A. in their primes. Therefore, nothing from the 1960s will get too close to this list. The 1978 Finals between the Washington Bullets and Seattle SuperSonics were dramatic, but did they rise to an all-time height? The 1974 Finals featured an iconic moment – Kareem’s game-winning skyhook in Game 6 – but Boston blew out the Bucks in Game 7 in Milwaukee, and home teams won just two of the seven games in that series, the Bucks only one out of four. That speaks to inconsistency. Nothing from the 1990s makes the cut – the two Bulls-Jazz Finals were extremely dramatic, but the quality of play was hardly what one would call “refined.” The 1990s were just an ugly decade for pro hoops after Michael Jordan’s first retirement in 1993. The best NBA Finals of the 2000s – one in which both teams had their fair share of moments and also lent some aesthetic value to the proceedings – was 2006. (The 2005 series was the only Finals from 2000 through 2009 to go seven games, but San Antonio and Detroit played some rough-on-the-eyes hoops.) However, the Dallas Mavericks choked, and Game 5 – one of the two pivot points in the series – will always be clouded by the officiating Dwyane Wade received (and smartly exploited, to his credit). The 1970 Finals produced a series with two iconic moments, two big-market teams, loads of stars, high-scoring games without a three-point line, and a history-making conclusion for the Big Apple’s generally snakebitten hoops club, one which managed to defy its history in the early 1970s. Yes, LeBron James had to play poorly in order for Dallas to win its first title, but the Mavericks earned this series with brilliant performances from Dirk Nowitzki, Jason Terry, Tyson Chandler, Jason Kidd, and (off the bench) J.J. Barea. Furthermore, after the wrenchingly awful Game 7 between the Lakers and Celtics in the 2010 Finals, and after the Chicago Bulls played their rough brand of defense to try to drag down the Heat in the 2011 East Finals, the 2011 NBA Finals showcased a more open-court game. Dallas was positively symphonic in the latter stages of Games 4 and 5, and consistently fluid in Game 6. Miami didn’t craft a complete team performance in this series, but Dwyane Wade was magnificent, doing all he could to carry the team with LeBron scuffling. This was entertaining basketball, and the fact that it gave Dirk the NBA title he had pursued for so long lent a special poignancy to the occasion. The Lakers, trying to become the first team to repeat since the 1969 Boston Celtics, needed seven games to advance past the Utah Jazz (West semifinals) and Dallas Mavericks (West finals). When Detroit spanked the Lakers in Game 1 of the NBA Finals in The Forum, Los Angeles had to expect another seven-game series – this, with a 41-year-old Kareem Abdul-Jabbar. The Lakers – by winning a 1-1 Game 3 in Detroit, something they would not do 16 years later in the 2004 Finals – assured themselves that at the worst, they would return to Inglewood (Calif.) for Game 6. It was then that the 1988 Finals ascended to the highest reaches of the NBA postseason pantheon. Isiah Thomas, on one leg, scored 43 points in Game 6, 25 in the third quarter. Yet, the Lakers stayed with the Pistons every step of the way. Yes, Bill Laimbeer did not foul Kareem on that late skyhook (though I’ve seen many worse calls in the league), but Kareem still had to make both foul shots, which he did. Then, in Game 7, James Worthy delivered the signature performance of his career: 36 points, 16 rebounds, 10 assists. Big Game James secured a place in the Basketball Hall of Fame on that night. Greatness won this Finals, in the face of greatness from the other side. It was the last truly sparkling edition of the Finals in a decade – the 1980s – which revived the NBA and offered the most indelible moments in the history of professional basketball. The game everyone will remember is Game 6, and Game 7 was supremely dramatic in its own right, with Tim Duncan missing that late bunny against Shane Battier and then slapping the floor with a level of frustration which has exceeded any other show of emotion we’ve ever seen from The Big Fundamental. Yet, this series – filled with smart and fluid basketball on both sides, and some unreal shooting performances from the likes of Gary Neal and Danny Green – offered one of the hidden single-game gems in the history of both the Finals and the NBA postseason at large. Game 1 of this series – you need to see the box score – witnessed only 24 total fouls, with only two players even committing four and no one committing five. That’s an average of six total fouls per quarter, one for every two minutes of scoreboard-clock time. There was no fouling festival in the final minute. Tony Parker sealed the win for the Spurs with an incredible off-balance shot in the last 10 seconds of regulation. The two teams – while playing expertly on defense and avoiding fouls – committed a total of only 12 turnovers, just four by the Spurs. Verily, this might be the single most underrated and underappreciated great game in NBA history, all things considered. It set a great tone for a thoroughly memorable Finals series. Yes, there were a few blowouts thrown in here, but in the 1985 NBA Finals, the Los Angeles Lakers cleaned up their act and did the things they failed to do (enough of) in the 1984 series. 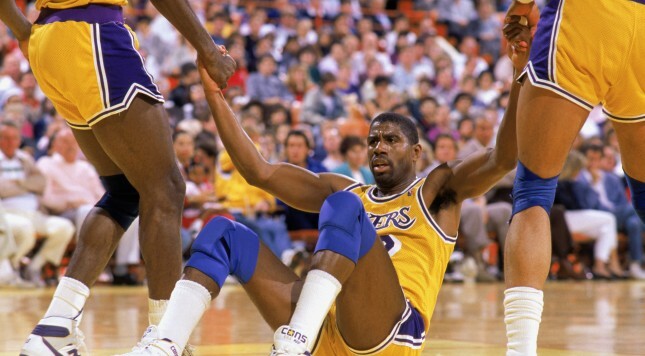 Magic Johnson became a better, more disciplined point guard after his 1984 stumbles. James Worthy didn’t commit the crippling mistakes he made a year earlier. Kareem Abdul-Jabbar, at 38, won the MVP award of the series, but more than that, he posted a 30-17-8-3 stat line (points-boards-assists-blocks) to win Game 2 in Boston Garden, just days after “The Memorial Day Massacre,” when he and the rest of the Lakers were AWOL against the Celtics. Against the greatest of champions, a franchise which doubled as a history-long nemesis, the Lakers finally looked the Celtics in the eye and surmounted them. The series was significant, but it was also played at an extremely high level. Unlike the 1987 series, this did not feel like one-way traffic the whole way. This was a series which started with Boston in the driver’s seat, and while the Lakers took 2-1 and 3-2 leads, the aftermath of Game 4 (won by Boston in a close game) brought back so many echoes from past Celtic triumphs over the Lakers in the Finals. It’s impossible to overstate how deeply the Lakers had to reach inside themselves to win this series, easily the most important non-Michael Jordan Finals of the past 30 years.